WASHINGTON -- Over the past six months, the Obama administration has quietly embroiled the U.S. in a Middle Eastern war that has left more than 20 million people in need of humanitarian aid and killed at least 5,000. U.S.-backed Sunni Arab nations, led by Saudi Arabia, have bombed weddings, left families to starve and looked the other way as an al Qaeda affiliate has used the confusion to seize significant territory. 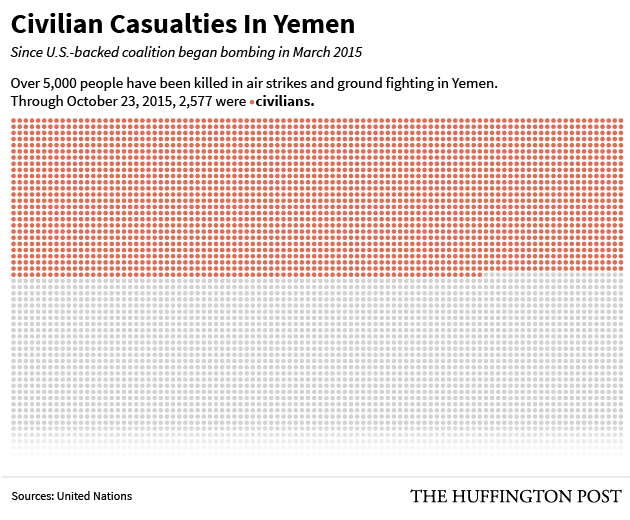 Civilian casualties are growing daily. A Yemeni man who was wounded and lost his home because of an airstrike by the U.S.-backed Saudi coalition in the Yemeni capital of Sanaa on April 30. Administration officials have said for months that the U.S.'s most important role in Yemen is to call for peace, and that Obama supports United Nations-led negotiations between the Saudi-backed president and the Houthi insurgency. "We share concerns about Yemen and the need to restore a function[ing] government that is inclusive and that can relieve the humanitarian situation there," Obama said when Saudi King Salman bin Abdulaziz al-Saud visited Washington in September. But these statements don't matter, rights groups say, as long as the U.S. continues to support the Saudis' military campaign and their resistance to an independent investigation into the conflict, which they demonstrated recently in a United Nations scuffle. Yemen watchers claim that one reason the civil war has continued -- with tragic consequences -- is the lack of a determined U.S. push for peace. Civilian casualties are higher in the war in Yemen than in other conflicts of similar length because strong explosives are being used in heavily populated areas, Ole Salvang of Human Rights Watch wrote in a recent piece for Newsweek. Such bombings could violate the laws of war, Salvang suggested. The Houthis and their allies have battered civilians as well, most recently killing 15 civilians and wounding more than 70 in attacks on the city of Taiz. 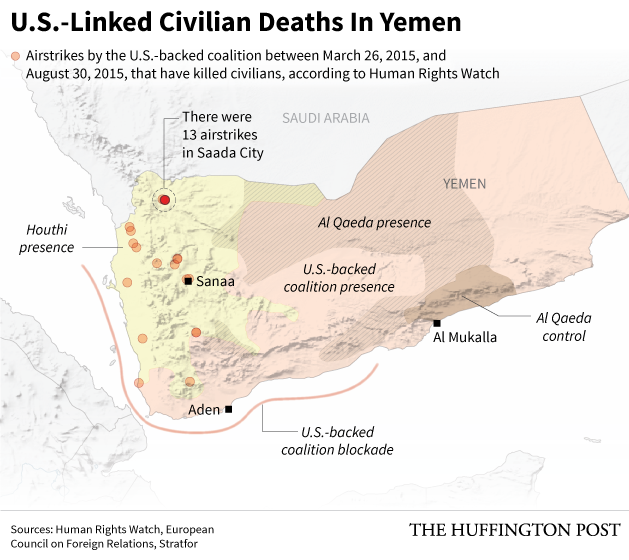 But the Houthis' military might is nowhere near that of the U.S.-backed Saudi coalition, Salvang noted. 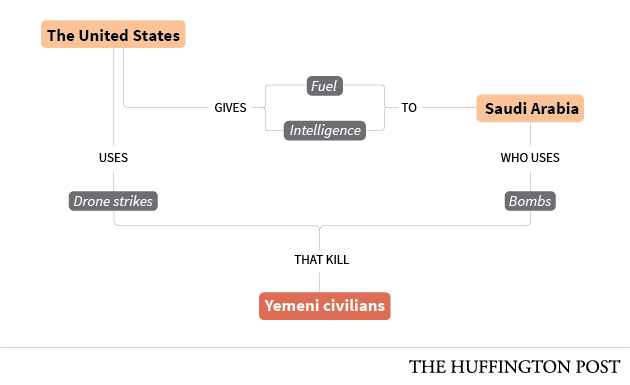 "Thanks to the U.S. government’s deep involvement in what many Yemenis call the 'Saudi-American' military campaign, American hands are far from clean," Paul O'Brien of Oxfam wrote earlier this month. He described Yemeni families fleeing their homes with nothing, and critical needs like food and electricity going unmet because of the Saudi-led coalition bombing facilities like ports and power plants. Washington has been paying increasing attention this month to the U.S. support for the Saudis' war, following the first major congressional hearing discussing Yemen on Oct. 6. Sen. Ed Markey (D-Mass.) warned during the Senate Foreign Relations Committee hearing that the Saudi-led coalition's reported killing of civilians and its extensive blockade, which hinders the flow of food and medicine into Yemen, could allow Congress to punish coalition members under a law that forbids U.S. military assistance to human rights violators. Days later, Reps. Debbie Dingell (D-Mich.) and Keith Ellison (D-Minn.) began circulating a letter calling for Obama to do more to help civilians and end the conflict. They sent that letter -- eventually signed by 13 members of Congress -- to the president on Oct. 16. Steps like those might be the only way to reduce the bloodshed, Bockenfeld suggested. "The United States has major leverage in this conflict, and could help bring the fighting to an end by withholding new arms sales to Saudi Arabia," he wrote in an email to HuffPost. The administration says it's listening and trying to balance commitments to top Middle East partners and to U.S. principles. "We're trying to be responsive to our allies' needs," a senior administration official told HuffPost earlier this month. "At the same time, our actions are also impacted by the fact that we are very concerned about some of the civilian casualties that appear to have emerged from their actions and we’ve asked for investigations." The critics' ability to influence that position on Yemen remains limited. Following the Senate hearing, Senate Democrats placed a hold on the transfer of precision-guided bombs to Saudi Arabia as they awaited more information from the Obama administration on Yemen, Al-Monitor reported. But that's just one deal. Overall, U.S. arms have continued to flow to America's Sunni Arab friends. Administration officials announced last week that they had approved another sale to Saudi Arabia: this time, an $11 billion agreement that would give the kingdom four advanced warships to add to the very fleet currently blockading the Yemeni coast. Administration officials say the U.S. is backing Saudi Arabia in the Yemeni conflict in part to alleviate Saudi worries about Houthi attacks across the Saudi Arabian border -- and in part because Washington is worried that standing by as an insurgency rapidly topples a government friendly to the Saudis and Americans could set a bad precedent in the region. Stephen Seche, a former U.S. ambassador to Yemen who is now with the Arab Gulf States Institute, said at the Senate hearing earlier this month that he saw the Saudi-led campaign in Yemen as the product of a "collective anxiety" in Riyadh and the other Sunni Arab capitals about "a resurgent, re-legitimized Iran." Some on Capitol Hill are sympathetic to that reasoning. Sen. John McCain (R-Ariz.), chair of the Senate Armed Services Committee, and Sen. Jeff Flake (R-Ariz.), who sits on the foreign relations committee, both told The Huffington Post last week they feel the U.S. must support the Saudi-led coalition. Like most Iranians, the Houthis adhere to a branch of Shiite Islam, which makes them different from the Sunnis of the Gulf states -- particularly those who follow the extreme branch of Sunni Islam supported by the government in Saudi Arabia. Even prior to its latest uprising, the group had received weapons and money from Iran. Since the Houthis took the Yemeni capital last year, the U.S. says it has learned of Iranian flights that have carried such material, and has searched Iran-linked ships suspected of trying to resupply the Houthis. But Yemen experts still doubt the Houthis take direction from their co-religionists across the Gulf. "I don't think the Iranians are there in any decisive way," Seche, the former U.S. ambassador, said at the Senate hearing. "The Houthis were able to do what they've done because they were speaking to the population." Most analysts believe the Houthis rely more on the military strength and local influence of Yemen's former president, one-time Saudi ally Ali Abdullah Saleh, than they do on Iran. When Tehran has tried to direct Houthi actions, it has sometimes been ignored. Last year, the Iranians urged the Houthis not to march on the Yemeni capital of Sanaa, The Huffington Post revealed in April and Obama told reporters in August. The Houthis seized the city anyway. Iran has proclaimed its support for the Houthis' rights and criticized the Saudi-led campaign regardless. Doing so is a cheap way for it to suggest it has great influence in the region -- and a role in the Houthis' success -- without seriously losing money or manpower. Some State Department officials familiar with Yemen think the White House's current course -- backing the Saudis, whatever the consequences -- is downright dangerous for the future of the region and American national security, a senior Gulf diplomat recently told The Huffington Post. National security adviser Susan Rice maintains the Yemen situation is an opportunity for the Obama administration to encourage Arab partners to solve their own problems, the diplomat said. The diplomat told HuffPost that State Department officials see that line, popular as it is among war-weary Americans, as short-sighted -- it ignores the way the Saudi-backed coalition is guaranteeing trouble in Yemen for decades ahead by destroying much of the country's critical infrastructure. The White House declined to comment on the disagreement. Al Qaeda in the Arabian Peninsula, which has long been based in Yemen but was limited in its reach before the country began to implode, took over a provincial capital in April and controls much of Yemen's largest province. Over the weekend, extremist militants with reported links to al Qaeda stormed a prison and a supermarket in the port city of Aden, which the Saudi-led coalition emptied of Houthis in July. 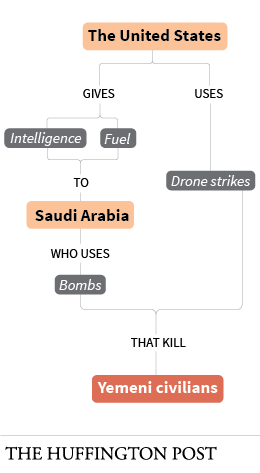 That's all despite continued U.S. drone strikes on the Qaeda affiliate, which in conjunction with the Saudis' actions are simply expanding the group's appeal further, some analysts believe. A branch of the Islamic State group has also tried to assert itself in Yemen, claiming responsibility for bombings targeting both Shiites and Sunnis. It hopes to convince Yemeni Sunnis that only the Islamic State -- not the Saudi-led coalition or the Houthis -- will represent their interests. Meanwhile, some Yemeni counterterror units trained by the U.S. now appear to be working instead to secure Houthi rule, according to an American held captive by the Houthis whose story was published in The Washington Post last week. Allowing such a situation to continue means undermining what analysts say should be the primary goal of U.S. policy in Yemen: preventing the creation of an extremist base that could be used to launch attacks on American targets. "US aims in Yemen are to ensure that [Al-Qaeda in the Arabian Peninsula] does not become like Al Qaeda in 1990s Afghanistan," Alex Ward of the Atlantic Council told HuffPost in an email, referencing the haven that terrorists found in a Taliban-run nation and used to plan Sept. 11. Still, the U.S. links to the Saudi-led coalition mean Obama can't secure the outcome he wants in Yemen until he has the Saudis' say-so. On Friday, the U.N. envoy to Yemen said he believed both the Saudi-backed president and the Houthis were now ready for face-to-face negotiations. But observers of the conflict warn that rhetoric on both sides is only getting stronger and that a ceasefire may be a long way away because, for now, both the Saudi-led coalition and the Houthis feel they are making gains, while other actors in the conflict distrust outside mediation. As Yemen waits for the U.S. partner and its enemy to make peace, the U.N. envoy noted, "civilians continue to face a deteriorating humanitarian situation and suffer the consequences of blatant disregard for the laws of war." The story of one civilian who faced those consequences went viral last week. On Wednesday, social media accounts in the West and in the Muslim world began sharing a video of a child who had been injured, allegedly in a Houthi missile attack, begging doctors not to bury him -- to give him a future different from that of thousands of other Yemenis around him. The boy, 6, died four days after he was filmed, CNN reported. Per Muslim tradition, he was buried soon after. Ruby Mellen and Mariam Baksh contributed reporting.